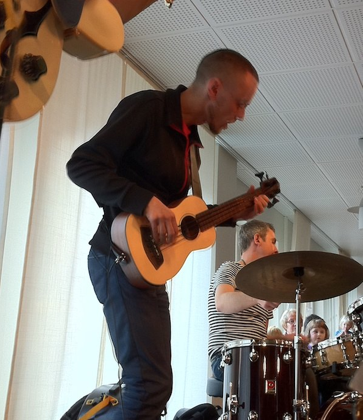 Playin’ my ubass for children @ the city Library, Orebro, Sweden! – Play UBass! Playin’ my ubass for children @ the city Library, Orebro, Sweden! I have a project with a couple of friends. It’s called ”Barnjazz – jazz för barn” (and it’s jazz for children not jazz on a barn 😉 We play famous swedish children songs in ”jazzier” versions! The clip below is from one of our shows. It’s two songs ”Bonka bonka” by the group Electric Banana Band and ”Kalles klätterträd” by Jojje Wadenius. Both songs feature the UBass! Pingback: Jammin’ with my Kala UBass | 10 « Play UBass! Pingback: My UBass on Swedish TV! « Play UBass! Pingback: Tips and tricks – amplifying your Ubass! « Play UBass!